Mariska Breland was diagnosed with multiple sclerosis in 2002, and two years later her mother passed away from cancer. She struggled with the diet choices she was making, as well as the fact that her corporate career wasn’t very fulfilling. When she came across an advertisement for Integrative Nutrition late one night, she couldn’t shake a gut feeling that by signing up for the Health Coach Training Program she could find what she’d been looking for: a chance to make a difference. Not only did the program change the way Mariska thought about food, it allowed her to incorporate healthy habits and business and teaching skills into her Pilates practice. Since graduating in 2005, she has trademarked her personal brand, Fuse Pilates, and has built a thriving company in one of Washington D.C.’ s hottest spots, Dupont Circle. Looking to the future, Mariska hopes to expand her practice even further, while watching her clients transform their bodies and find a healthier lifestyle. Read more about her success as a Health Coach below! Before IIN, I was working in a high stress career as a creative director for multi-million dollar events. I was very successful at my job, but after a diagnosis of MS in 2002, and my mother's death from cancer just two years later, I started wondering what I was doing to actually make a difference in the world. I had become really interested in alternative medicine and diet immediately after I was diagnosed with MS. In fact, my first thought was, what was I eating? I started changing my diet, and a lot of other medical issues started clearing up (including eczema, years of digestive issues, etc.) How I found the program: insomnia. Seriously. I was surfing the Internet and came across an ad for Integrative Nutrition on a yoga website. The deadline for registration was just two weeks away. I wasn't sure I could get the time off of work, or find the money, or travel to New York City (it was only held in New York at that time) but I couldn't shake the feeling that this was something I was supposed to do. So I signed up! I stopped being vegetarian, rethinking whether it was healthier to eat naturally raised chicken or a processed soy chicken nugget. I began making career changes by teaching more Pilates, counseling clients, and holding healthy eating workshops. I discovered that fitness was my true passion and the correlation between healthy eating and the right exercise program was crucial for me to regain my own health. Over the years I expanded my Pilates practice, trademarking my own brand, Fuse Pilates. I developed training materials, trained teachers, found business partners and opened the first of what I hope are many Fuse studios focused on a unique, effective form of Pilates with health coaching offerings working with other Integrative Nutrition graduates. I learned a lot about nutrition, but I think the program has a way of sending you on a real journey to figure out what it is you want in life. I think that's something great about IIN, that health coaching isn’t the only place you can take your education. I found my passion to be in fitness. The people. Everything surrounding Integrative Nutrition for me was "universe coming together" kind of stuff. My mom had recently passed away. She was Dutch, and the roommate I found on an IIN message board was also Dutch. She became a great friend. I also found it inspiring. How could you not when Deepak Chopra is one of your teachers? It adds to my knowledge as a teacher. I've had students who come to me in pain, and that pain isn't caused by what they're doing in their workouts (or lack of workouts.) Many times it comes from lifestyle choices, including diet. I have learned the tools to help them figure out what works and teach them to have a healthier, happier lifestyle. I think there's a need for health coaches everywhere. Each day it seems a new and contradictory study comes out, or there's a new diet book. We used to be afraid of eating fat, then it was sugar, now its gluten and dairy. Health coaches help people navigate the crowded marketplace of diet information to help them figure out what truly works for them. I love seeing my students and clients change. It doesn't have to be weight loss or getting awesome arm definition, it's all about seeing people enjoy being present in their bodies. I think when people learn to love being there, true transformation can occur. They'll begin wanting to take better care of themselves. It's very rewarding to see. Fuse Pilates builds on traditional Pilates exercises and teaching styles with an original, fun, and highly effective twist on Pilates mat and apparatus classes. 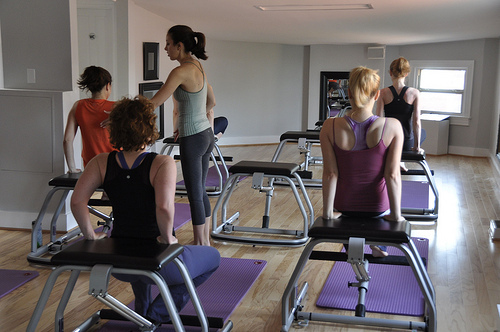 Growing popularity of the Fuse Pilates method prompted the opening of the Fuse Pilates Playground in Washington D.C.’s Dupont Circle in June 2011. Each class is uniquely customized to student requests and choreographed to upbeat music. Classes offer intense yet approachable mat, tower, reformer and chair instruction, along with private coaching and wellness counseling for beginner to expert levels. Our instructors are highly trained and experienced, concentrating on 360 degrees of the body to shape and create beautifully toned physiques while promoting overall health and wellness.